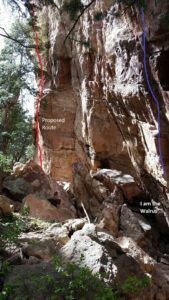 The proposal for a new climb on South face of Seal Rock, with temporary reference name “Super Tuscan”, is located in the upper part of that wall, about 50 ft up the slope and West from existing route “I am the Walrus”. 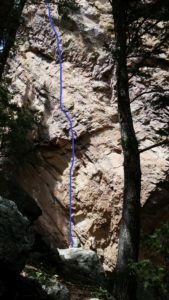 To date, there are 7 sport (bolted) routes on the South face. The proposed new route starts right behind a prominent block at the base of the wall and continues straight up through a small v-shaped roof, vertical faces above to a green streak left of slightly overhanging dark prow and ends above and right of a distinct vertical light-colored depression. The length of the route is about 130 ft. The line is consistent in angle, follows bands of good stone and requires minimal cleaning from loose or detached flakes. Climbing type is also consistent with good grips on edges, pockets and “nuggets” typical for this entire cliff. The approach is via the designated but unsigned climber’s trail referred to as “Harmon Cave Trail”, an OSMP Trail that leaves the Mesa Trail near Bear Canyon and heads west to the eponymous cave. The trail has traditionally been used to access the south -, east- and north-face climbs. Where this trail gets to the northeast toe of the rock, a constructed trail crosses a boulders’ field and climbs up to the base of the Seal Pup to a saddle at the bottom of Seal Rock’s south face. From here a gently inclined gully leads up along the south face below the climbs. The descent will be via a lower-off from the top of the climb, which deposits you back on the big rock at the starting point of the climb. The staging area at the base of the climb is comprised of boulders’ field with a flat surface in between with compact soil with no vegetation. The area is well contained with no potential for erosion. There is one large boulder slightly to climber’s right of the start of the route. The route would start straight from a smaller boulder. Approach trail (seen far below is the staging area under Choose Life) and staging/belaying area under proposed route. Has all reconnaissance work that can be reasonably done, short of placing any hardware, been done? Reconnaissance for the route has been done. 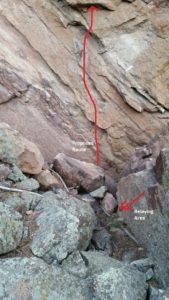 Due to the overhanging nature of the rock (about 100 degrees), slightly diagonal direction of the line and its length as well as difficulties in setting a rappel with access to majority of the route, it was difficult to stay on the rock in multiple sections and check all the moves. Reconnaissance confirmed that there are good grips on the entire line with different options on how best to do the moves. The difficulties seem to be in the range of 13- at the most, as compared to routes on the same cliff. Has the route been top roped? Is there loose rock? Is it extremely overhanging? 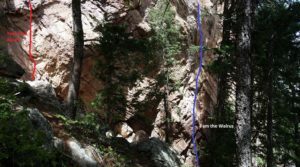 No top rope climbing has been done yet due to the length and steepness of the line. There were no placements for directional gear which made it hard to stay close to the rock. Majority of moves will be able to be done only after bolts are placed. The rock quality is very good, clean and compact sandstone/conglomerate mixed with bands of solid brown rock on almost entire line. It is expected that a few loose and small flakes on the lower part of the climb would need to be removed for safety. Upper half of the route has good quality stone. 13 minus?! May it be so. This route should be approved. Looks good to me! Equip this route. Looks like a nice addition. Yes. Doesn’t appear to be crowding other lines, and looks clean. Should be approved.